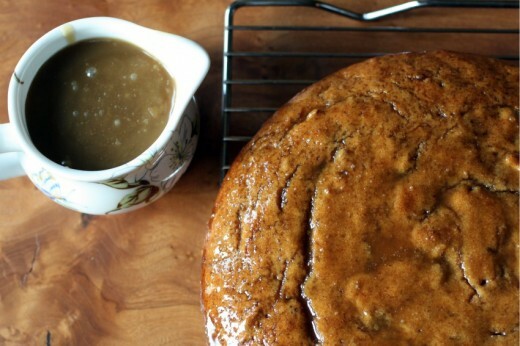 Put away any pre-conceived notions you have about Sticky Toffee Pudding. Unless your pre-conceived notions about Sticky Toffee Pudding is that you like it very much. In that case, keep your pre-conceived notions and go take 1½ sticks of butter out of the fridge. Look, when I check out a dessert menu, my eyes glaze over until I see chocolate. I can appreciate a good apple tart and I like ice cream, and raspberries are awesome, but friends – dessert is chocolate. Period. But. This time of year, something happens. I never lose my chocolate affinity but my mind opens just a bit. It would never occur to me that I would like a cake that has puréed dates in it and it may not occur to you either, which is why I am asking you to put aside those notions of yours. A couple of years ago, I took a holiday cooking class with Olaiya Land. She is now one of the co-founders of The Pantry at Delancey and she is a very good cooking teacher indeed. In that class, we made Sticky Toffee Pudding and I silently pooh-poohed it and decided to eat my dessert’s worth of calories in savory bread pudding instead. Big mistake. 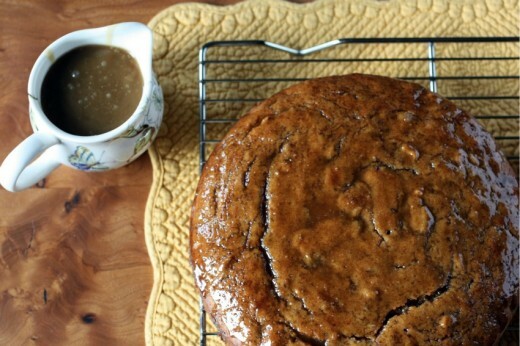 The cake, which really looks like nothing special, smelled like the very best of everything (butter, brown sugar, cinnamon) and, with a caramel-y toffee sauce poured over the entire cake and the same sauce served alongside it, I realized my short-sightedness. It’s not chocolate. But it’s easy, crowd pleasing, and can be made in advance and frozen. I make this cake in a round cake pan but you can certainly use a square. And because I have two of them (actually I have four – don’t ask), I usually double the recipe and freeze one for later use. Don’t glaze the cake you are going to freeze. Olaiya serves this with whipped cream but I just like to pour on extra sauce. Preheat oven to 350ºF. Butter an 8-inch square or 9-inch round cake pan and set aside. Put dates, rum, and ½ cup water in a small saucepan. Bring to a boil over medium-high heat, stirring occasionally. Reduce heat to medium-low. Cover and simmer until dates are very soft, about 5 minutes. If the dates have not fallen apart, mask with a fork or potato masher to break up any large chunks. (If you prefer to not even know the dates are there, you can blend the mixture with an immersion blender or put it in a stand mixer.) Set aside to cool for 10-15 minutes. In a medium bowl, whisk together the flour, baking powder, salt, cinnamon, and baking soda. Set aside. In the bowl of an electric mixer fitted with the paddle attachment, cream butter and brown sugar on medium-high speed until pale and fluffy, 2-3 minutes. Add eggs, one at a time, mixing well after each addition and scraping down the ixer bowl as needed. Reduce speed to low. Add flour mixture in 3 additions, alternating with the date mixture. Transfer batter to prepared pan and smooth top. Bake for 25 minutes, then reduce the heat to 325ºF and bake until cake tester inserted into the center of the pudding comes out clean, 15-20 minutes more. Let pudding cool in pan on a wire rack for 5 minutes. Run a knife around the edges of the pan to loosen and invert onto a serving plate. In a medium saucepan, bring cream, brown sugar, and butter to a boil over medium-high heat. Boil for 3 minutes. Stir in rum and cook for 2 minutes more (you should have about 1½ cups sauce). Put a piece of parchment or waxed paper under the rack (this will catch the drips). Pour half of the sauce, slowly, over the warm pudding, allowing it to drip down the sides. Serve the other half of the sauce along side. I’m with you on the chocolate desserts all the way! I don’t think I’ve even ever tasted sticky toffee pudding before, it always just sounds so sweet. But you’ve inspired me to try some now! So, I do like sticky toffee pudding very much, and I’ve been intending to try making it for years. Now, I must. Soon! OK, I’m sold. I have another friend who is always raving about the wonder of sticky toffee pudding, too, and couldn’t believe I’ve never had it. I even have leftover dates in my house right now. As soon as the date nut cake’s gone (shouldn’t be long now), I’m veering towards this. I don’t think I’m QUITE as much of a chocolate person as you are, but for me caramel or dulce de leche does the trick. Although, to be fair, I’m totally an equal opportunist when it comes to sweets. And I do love dates. I could eat them like candy. So I’m sure toffee pudding is something I’d adore! Dear goodness, I’m in love! Yum I am all for sticky toffee pudding!! This looks delicious. This looks incredible. I’ve never heard of sticky toffee pudding but, after seeing the recipe, I have to wonder why eating isn’t a national pastime! 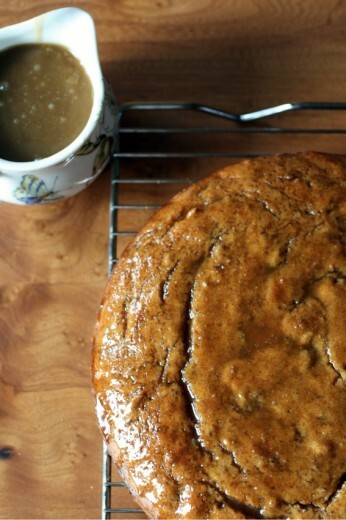 I’ve been hearing a lot about sticky toffee pudding lately… I think it’s a sign that I need to make it! Looks so fabulous… Perfect for the holidays! I made this for Christmas dinner (as written) and it was fantastic. Thanks Dana and happy new year!